Despite the good performance of my 4-square array, which achieved a F/B of 30 dB, for most of the time Flag and Pennants were better thanks to their low noise level. 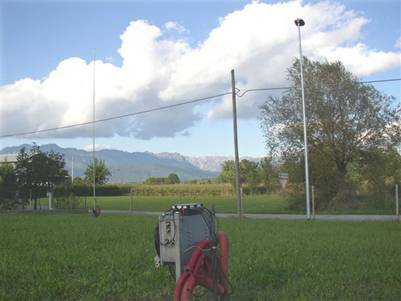 I thought the top loading wires of the antenna elements were responsible for noise pick-up, so I cut them, shorted the verticals and changed the system to the K7TJR Hi-Z 4-square array.All the story with my comments and some graphs of the tests on the SDR-IQ with a 1.843 test oscillator can be found in this downloadable 8 pages PDF file. Though it did not make the miracles I hoped, the K7TJR array works very well from MW, where an impressive F/B of 36 dB is shown on a BC station, to 80 and 40 meters. 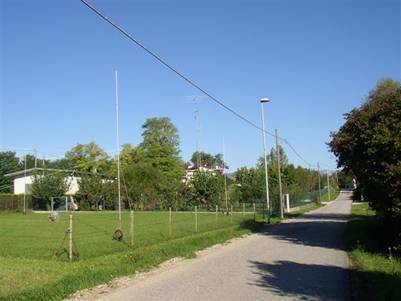 On 160 m. the F/B is “only” 20 dB, but my array side dimension are less than optimum and the noise still the same being too close to a high fence and power line on the left side and to the telephone line on the other, with an added new lighting metallic pole at about 20 feet from one ant. element. On the left picture you see the K7TJR small controller on top of my previous one. It needs only a 3-wire control cable and it’s ready for use: no loading wires, no radial system, and no need to tune or adjust anything! (Of course, I have no interests or business relations with Lee, K7TJR, and Hi-Z Antennas).